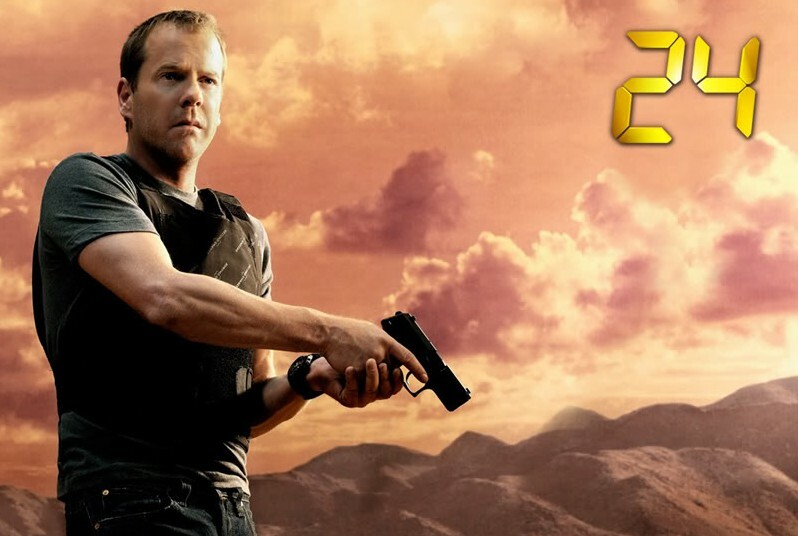 24: Is the Jack Bauer Movie a Sure Thing? After tonight, Jack Bauer is finally going to get a day off — for a little while anyway. Though 24 is going off the air, there are plans to make a movie based on the TV show. It’s supposedly going to involve Jack battling some form of evil in Europe. But, where does it stand? What do you think? Is the real-time format essential? What has to be in a 24 movie? 24: FOX Prez Says TV Series May End Soon; No Season Nine? 24 is a fantastic show, just finished the last season and now…… Bring Jack back! I think it should begin showing excerpts from the final few episodes, then go from there however they wish to write it. It just needs a better ending than the final episode depicted. I guess I don’t like cliff hangers! I really dont care if there is real time or not, PLEASE just bring 24 back either to the movie screen or another tv series would really be fantastic. 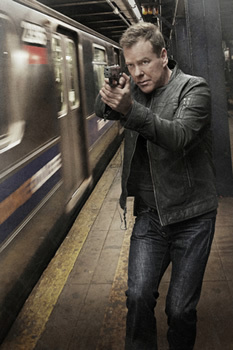 My family and I are HUGE fans of Jack Bauer and wished the tv series was never cancelled. PLEASE PLEASE PLEASE bring Jack back!!!! 24 needs to come back!!!!!!!!!!!!!!!! it is so good! my whole family loves it jack bouer and cloe are both my favorite people. I have never in my life seen a miracle like 24,well to me the film is a miracle because i have never seen a thing like this.i luv 24 and most especially habib marwan,president palma,jack bauer,tony,chloe and dubaku……………….i luv 24! I love 24 it is one the movies that has done my day. Whenever i could start watchinng it i could not move my single body coz its so entertaining. What i think, you should consider adding on more seasons coz Jack also deserves a better ending. For sure consider a 8th season and more. I think that there can be a compromise to the whole real time dilemma. Design the movie so that it is two hours long, but only have events occur in real time within each hour. This way, you keep the suspense of the ticking clock etc. but you can skip a few hours (maybe even a day) between the two hours. The problem with redemption was that you didn’t do this and it just made it feel like a two hour season premiere and not a movie. I read a suggestion from people involved with the show, that the first hour or so could be standard movie time. taking place over days or weeks-months. but the last hour could be real time. Would have to be done right, but I think this would be pretty cool. This is defenitly one of the besgt shows I have ever seen they need a diffrent ending though. The show let everyone off thinking what would happend next like it aLways does wich is good if u contuie it,, but if it ends therfe needs to be a finally movie or one more day and end it on a exallent note. I agree let jack be happy would be nice to help miliatry personal have hopes. i think that 24 is the best show i have ever seen in my entire life it is the most thrilling show ever…when season eight ended I couldn’t believe that it was over. I can not wait until the movie comes out it will be so awesome. Honestly real time would be great but whatever works to make the movie. I wait a week for watching it an hour in night from 9 pm to 10pm Kabul Afghanistan time.It is a really good movie that I saw in my life because when I am watching it. I feel that I am in case with Jack Bauer. Amazing it is really good movie.